Happy is the day that itchy fingers get some new vinyl, especially when it comes from Mr. Bird. 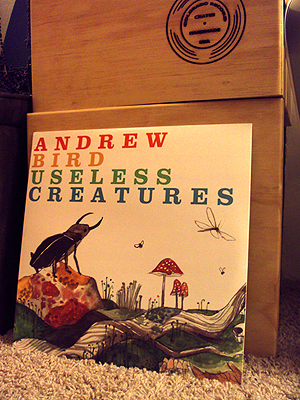 Originally part of the special edition of January 2009’s Noble Beast, today marks the release of the bonus disc, titled Useless Creatures, as its own LP. You can see my copy chilling there against the crate. I’ve been fond of Useless Creatures since I first heard it, and as time has passed I’ve returned to it more and more, both as a weathervane to try to guess where Andrew Bird is going next, and because I like it for what it is. Trending toward slow and dreamy, Useless Creatures is nine instrumental tracks of varying lengths. I tend to put the album on when I’ve got some thinking to do or when I feel like being quiet, but not silent. On the whole, I think of it as a companion album, but I mean it more broadly than the easy meaning of the other part of Noble Beast: it’s a companion for me. It’s an album I feel comfortable with. Since the album was released, I’ve been able to pull out a few motifs that Bird has played live — usually as the opener to his set, but sometimes they’ve shown up as bridges. He’s also played “Carrion Suite” live a few times, especially in late 2009’s solo European tour, and several of the pieces showed up in the gezelligheid shows, but the piece that has shown the most public evolution since the release of Useless Creatures has to be the second track, “You Woke Me Up”. The album version is sedate, even cautious, and takes its sweet time introducing its primary melodic line. Bird uses a myriad of violin techniques, as well as his usual looping equipment. There’s a minimum of audible distortion, and seemingly minimal contribution from Todd Sickafoose on bass and Glenn Kotche on percussion. The themes repeat and come to a near non-conclusion. The piece is a dark meditation — no narrative line, no catharsis, and no hint of eventual change. This is partly why I was left totally shocked at the first gezelligheid show in Chicago last year — which is where I heard the lyrics Bird gave the song for the first time. The primary difference, as far as the instrumental portion, between the album version and the version from the 2009 gezelligheid shows is arrangement. Bird didn’t have Kotche and Sickafoose with him at Fourth Presbyterian; he used his customary glockenspiel and distorted his violin looping a little further. Until the 3′ mark, the arrangements for live solo performance were the only real difference between the album version and this version. The vocals kick in at three minutes. Back in May, one of the things I touched on in my review of one of his shows at Largo at the Coronet in Los Angeles was how his lyrics are starting to be framed not as passive action, or action in response to outside stimulus, but as imperatives. “You Woke Me Up”, then and now, is a good example, and this is where I first heard them. To be honest, I’m still not sure what I make of the song in this draft, though I know I like it a lot. The lyrics borrowed from “Keep Your Lamp Trimmed and Burning” make me love the song on a gut level, though I’m still not sure that the lyrics aren’t placeholder lyrics — and I have to say that I hope they’re not placeholders. The problem with the song at this tempo is that the plodding, repetitive parts, with the tempo barely slower than an average heartbeat, draw attention to the sections that Bird has taken from “Keep Your Lamp Trimmed And Burning”, and it makes his original material seem like a mere framing device. His work is better than that, and the potential for interaction between the two sets of lyrics — Bird’s original lyrics, and the lyrics he borrows — is much greater than we hear in the gezelligheid version. More than that, though, what improves the piece is the wholly different instrumental arrangement in the first three minutes. If he’s officially recorded and released this particular theme or motif, I haven’t heard it, but I know he’s used it live before. The effect of leading into what we’ve known up until this point as “You Woke Me Up” with an instrumental piece that seems to have nothing to do with it is jolting: he’s waking us up, creating an unsettling feeling that steadies out with every layer he adds with the looping mechanism. With the Newport version, it feels more like he’s telling us a story — and more like the command to keep it together, you’re not alone is just that: a command. An imperative. This is what I mean when I say that his music seems to be growing more confrontational than it’s been up until this point. Like his earlier work, it presents problems, but the shift, again, is in the demand for concrete, decisive action. I’m hoping we’ll hear how this song has evolved in this year’s round of gezelligheid shows — I’m headed east for the first two shows in DC — because I expect it will have changed again. I’m also looking forward to seeing how the rest of the tracks on Useless Creatures may have changed. Thank you to the tapers who made it possible for me to share these last two recordings. I checked my files, and I didn’t see either a place I could credit your work or instructions regarding how you want it distributed. If you taped these shows and would like credit, please let me know — and thank you so much for what you do.